Heart Catch Pretty Cure! The Movie: Fashion Show in Paris! Also known as: Heartcatch Precure! Hana no Miyako de Fashion Show... Desu ka!? It's the movie for Heartcatch, which is a strong PreCure series. It's got all the regular cast, although sometimes only fleetingly. (Granny didn't go with everyone else to Paris, but she gets a quick cameo as she follows events online.) It's also pretty good. 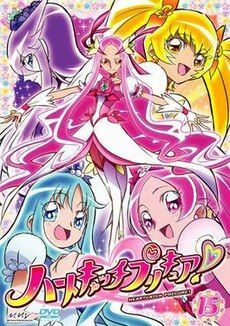 It's not brilliant and it struck me as a solid PreCure movie rather than something to change anyone's minds about the franchise, but I enjoyed it. It's about a ten-year-old werewolf who's the adopted son of a dragon. The werewolf was given the name Loup-Garou, but we'll call him Olivier. He used to be a nice boy, but then he freed Baron Salamander from 400 years' captivity and got "rewarded" by becoming not quite human. Salamander wants to destroy the Earth. Olivier disapproves and generally seems a bit confused by things, which won't help his relationship with the PreCures. Tsubomi wants to help him. She's like that. Olivier isn't sure whether it's okay for him to be near ordinary people (including PreCures) and is liable to be grumpy because he's trying to push people away. It's decent. It makes good use of all the regulars bar Granny. Tsubomi is the group's heart, while Moonlight is still cool. The plot's pretty much what you'd expect, but there's nothing wrong with it and the film got nominated for the 2013 Kidscreen Award. (The winner was Wapos Bay: Long Goodbyes, a claymation movie based on a Canadian TV series.) Having a rather well-portrayed Paris as its setting also got the movie a dubbed French release, even though I think the parent TV series has never had any non-Japanese dubs at all. Oh, and we also get new recordings of the opening and second closing theme songs. The closing theme almost stops being gospel, which is weird, while the opening song gets lots of added interjections. In both cases I prefer the original, but it's still fun to have these variants. If you've watched the TV series, definitely watch this film. You'd have no reason not to, although of course it's a standalone story that doesn't touch the ongoing plot. If you haven't watched the TV series... well, I suspect you'd still be okay. Expect it to be reasonably good, but not particularly memorable.